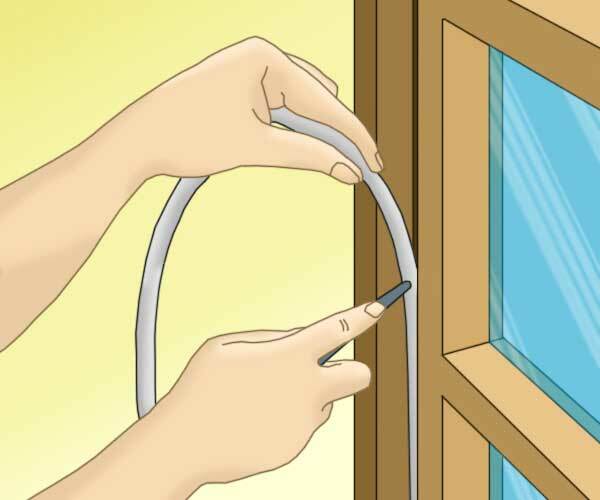 How to draught proof a sash window using various techniques including sealing beads, specialist products, secondry glazing, weather strips and draught excluders. Also includes information on ventilation issues after sealing. This project covers the specialits issues relevant to stopping draughts from sash windows and the best products to use. A sash window can provide a home with a real touch of character but like many areas of your home they do require maintenance. Common issues if this is ignored can include wet rot, cracked putty, failure of joints, rattling or sticking and draughts. A poorly maintained sash window can cause draughts within a room space that can be the equivalent to a small open window, making your living space uncomfortable to be in and also wasting you money on your heating bills and impacting on the environment. Sealing a sash window to stop draughts is difficult. 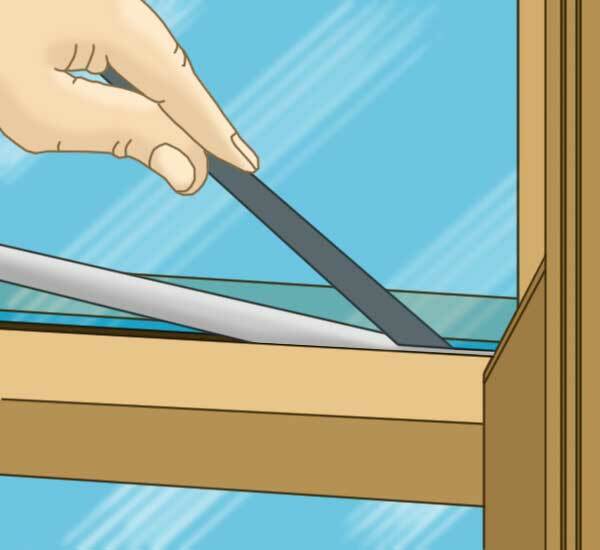 With the window halves sliding up and down, they tend to rip off any glued-on window seals. The gaps are also irregular over the length of the channels of the frame so that sometimes several layers of traditional sticky seals are applied leading to even bigger problems with peeling. It is also almost impossible to seal the space between the two window halves. It is certainly impossible if you do not want to show the seal when the window is opened in the summer. In essence when it comes to draught proofing a sash window and any form of draught proofing for that matter, the name of the game is to bring the ventilation of a room back under your control and not at the mercy of gaps and draughts. While this project is about draught proofing sash windows, and specifically DIY draught proofing, you can find more information about draught proofing other areas around your home in our general draught proofing project. There are literally hundreds of beads, weather strips and draught excluders on the market today and they come in a great array of styles, designs, materials and applications including compressions strips (usually made from a foam-type substance or springy plastic material) such as those available from Draftfix.co.uk, bristle strips (usually featuring a bristle similar to a brush) and some even in a weather proof felt-like material. Some are designed for general draught proofing and can be used on sash windows while others have been designed specifically for sash windows such as those available from Exiseal.co.uk. As you might imagine they all have varying degrees of success, some better than others but in most cases they inherently suffer from the same problems – if they are glued or stuck in place then they will eventually come loose and peel off and if they are nail or screw fixed then they will either damage the sash frame itself or look unsightly. In light of this we do not recommend any specific makes or brands and if you are tempted to go down this route for sealing your sash windows then it is very much "trial and error". One product we have seen that is quite good is the sash window seal Gapseal. 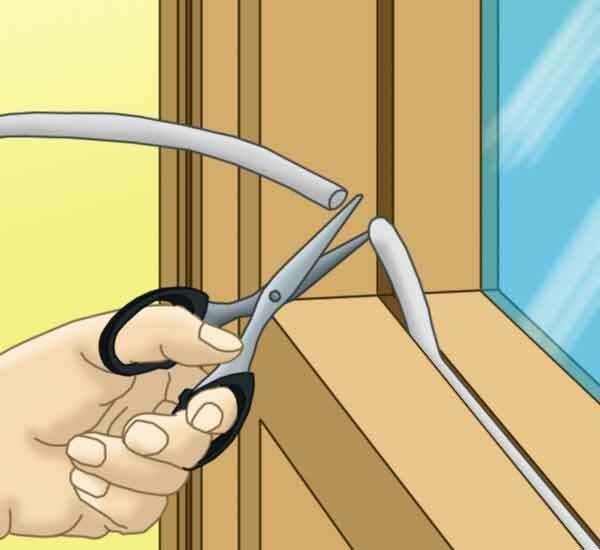 It is a flexible, non-permanent window sealer, which can be inserted at the onset of the cold time of year and removed in spring when the sash windows are used again. It can be used many times, does not absorb moisture and will bridge most gaps. Application is fast and easy. 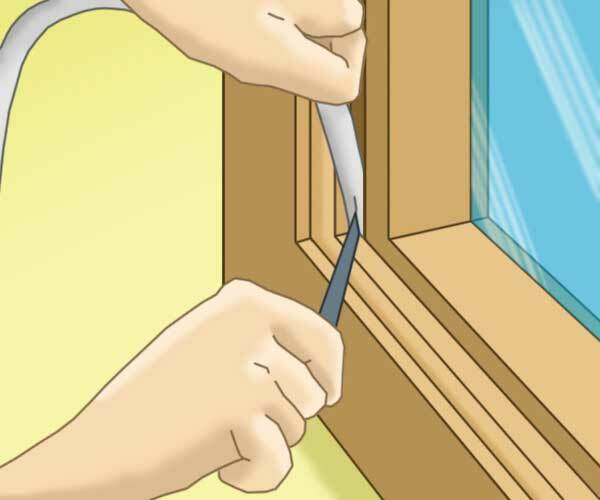 The sealant is pushed into the gaps around the window with a handy applicator. The sealant stretches so that small gaps can also be successfully filled. Once inserted, the magnolia coloured seals are invisible to the eye. The seal will always try to expand to its original size, making it fill any gaps created through expansion or contraction of the wooden frames. It is often through by many that fitting secondary glazing will completely ruin the aesthetic pleasure of a sash window and in the past this was true. Secondary glazing units tended to be bulky, ugly and difficult to use and live with but today there are quite a few specialist companies around that supply bespoke secondary glazing units that are designed to blend in with your existing windows and be as unobtrusive as possible. This is all very well but what are secondary glazing units I hear you ask! Well on a basic level its a window inside a window. A secondary window is fitted behind your existing sash window, as near or far to the existing window as you require. This secondary window, once closed, then seals the existing sash window in front of it preventing any draughts from passing into your room space. They come in a variety of different designs that include upward and downward slide opening, inward opening and they can even be removable enabling you to fit them in the winter when you will be less likely to want to open them and then remove them in the summer when it’s warmer. They can also be purchased as glass or light weight perspex. Aside from the draught proofing and cutting heating costs benefit, they also come with quite a few additional ones that include a reduction in condensation and noise and you do not need planning permission to fit them. Although this may sound silly, a heavy, thick set of curtains can go a long way in reducing draughts and heat loss from a room space. Although they will help hold heat in a room and prevent it for the most part from escaping through any gaps they will not block any gaps at their source e.g. the sash window itself so cold air will still pass in. Ventilation is a necessity in any room as without it humidity can increase causing condensation and eventually mould growth. If you are too effective with your draught proofing and seal a room up to a level where there is no longer any ventilation then it is likely that you will eventually experience the afore mentioned mould and damp issues. 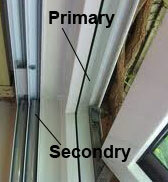 There are also building regulations that state a minimum background ventilation for a given room space and in most cases, fairly new sash windows will comply to this regulation but by their very nature, the opening and closing of the windows them selves will cause wear and over time the initial ventilation provided by will increase and this is where the above draught proofing techniques come into play. On this note there is also one other point to remember when undertaking any kind of sealing or draught proofing in a room – if you have any kind of gas appliance in the room or in your home e.g. gas cooker, gas fire, gas boiler then these appliances need a consistent supply of fresh air in order to burn safely. If they do not have this then they will not operate correctly and will produce a build up of carbon monoxide which can be fatal!